I’m a sucker for romance. 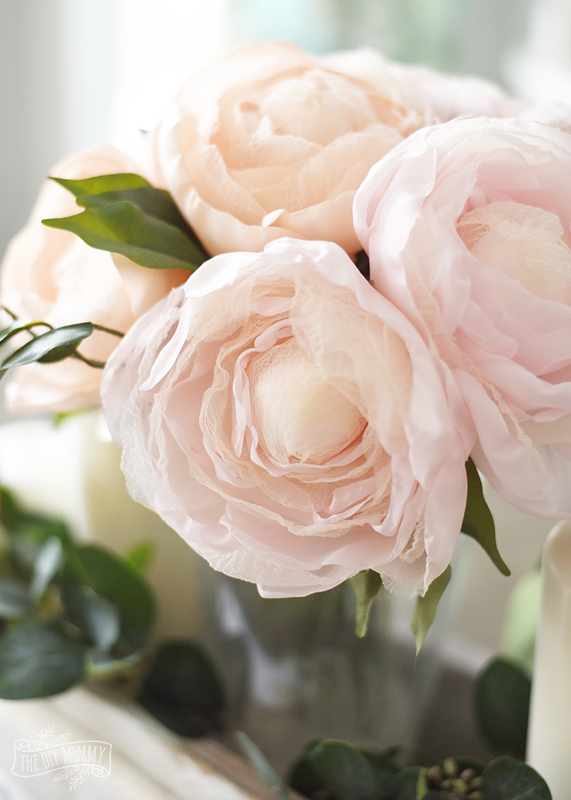 Give me ALL of the roses, candles, twinkling lights, poetry, and soft music, please! 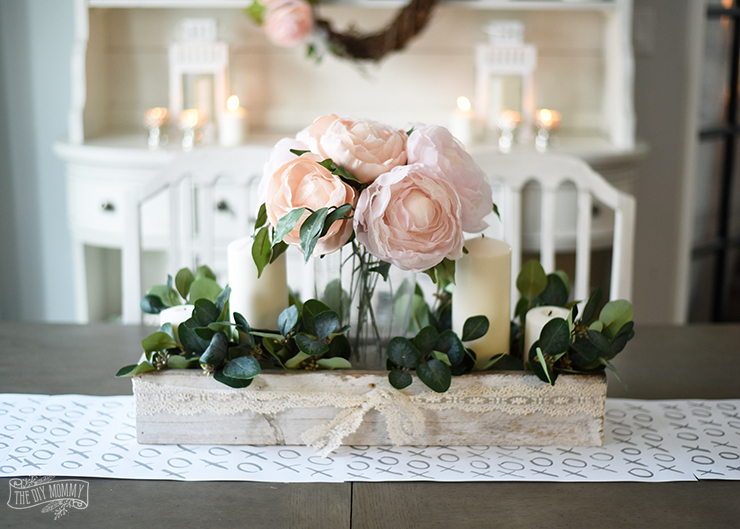 I almost like saving money as much as I like romance, so this year I gave myself the challenge of creating a dreamy, Valentine’s Day tablescape using only items I had on hand. Surprisingly, I think it turned out looking really lovely, and I’m excited to enjoy it this month as we celebrate love! I started out with my beautiful Hancock Park table, chairs and hutch from The Brick. 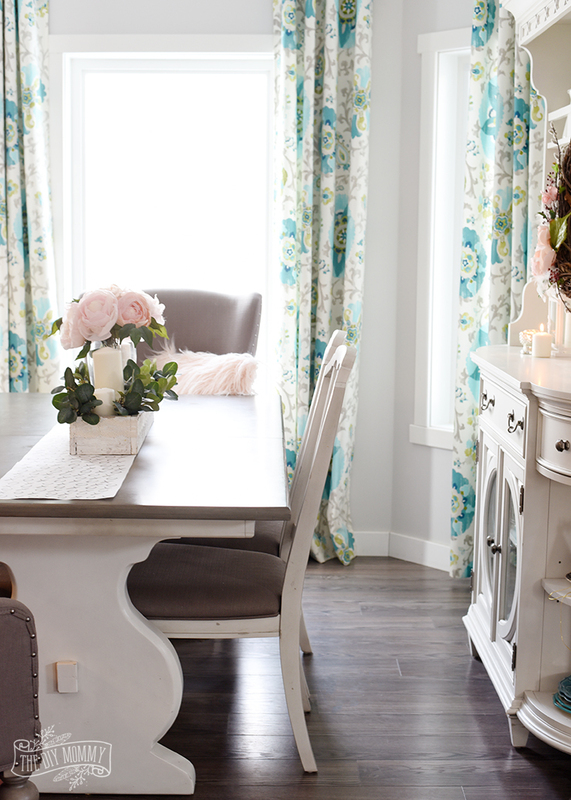 These pieces have made such a positive difference in the look and function of our dining nook space in our kitchen. They add the country farmhouse charm that I love to our home and I’m happy with how they’re holding up to our wild crew of kids and my less-than-perfect housekeeping skills. 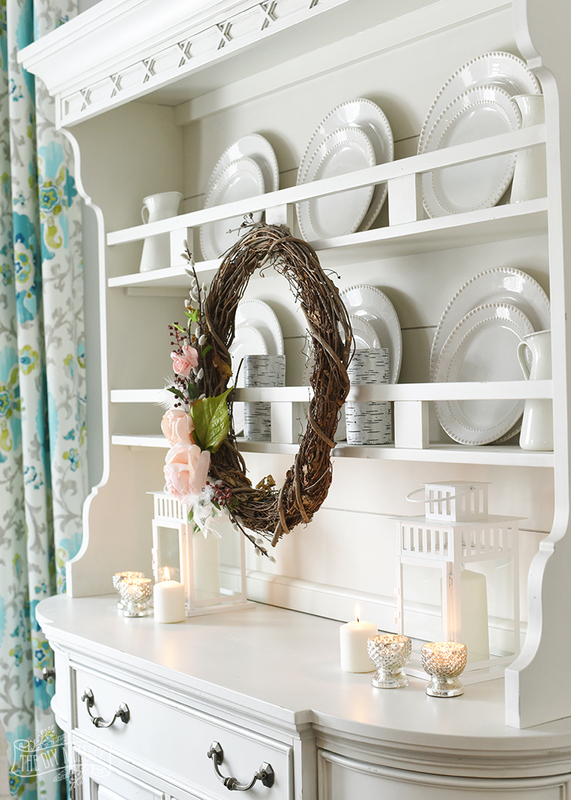 To begin this romantic, Valentine’s Day inspired look in our dining nook, I hung this DIY Spring wreath I made on our hutch. The grapevine base adds a rustic feel to the space, while the pink fabric flowers inspired me to continue the pink floral theme through the rest of the nook. White candles and lanterns add some sparkle! 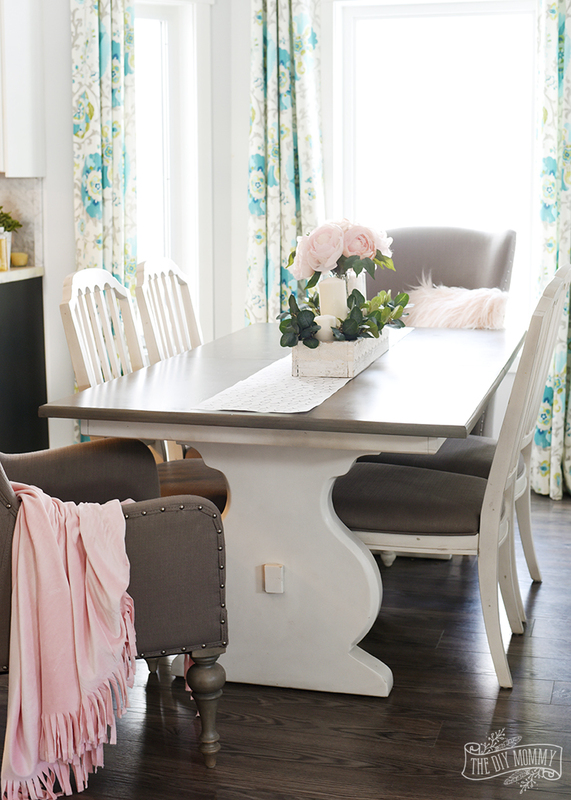 A blush pink DIY no-sew throw and my handmade pink faux fur pillow adds some softness to the end dining chairs. 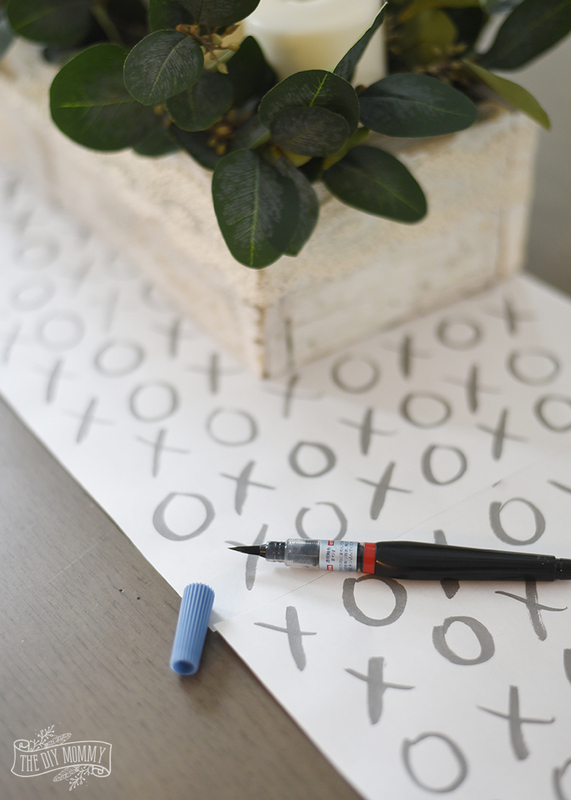 For a low cost festive table runner idea, I taped some large pieces of paper together and drew some X’s and O’s on them with my brush pen. I thought the paper runner turned out super-duper-cute! 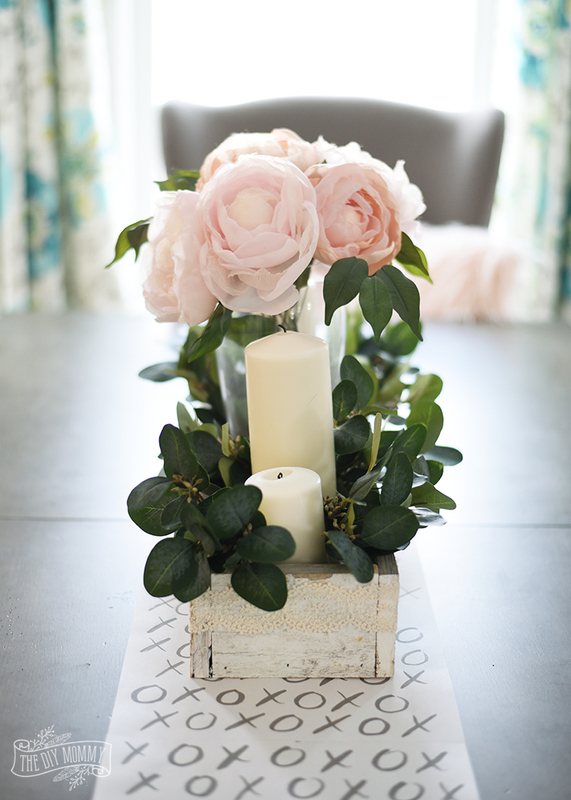 On top of the paper runner, I put a barn wood box that my friend made for me a couple of years ago, and inside that I placed some candles, faux greens, and this vase of handmade fabric peonies that I made last year. 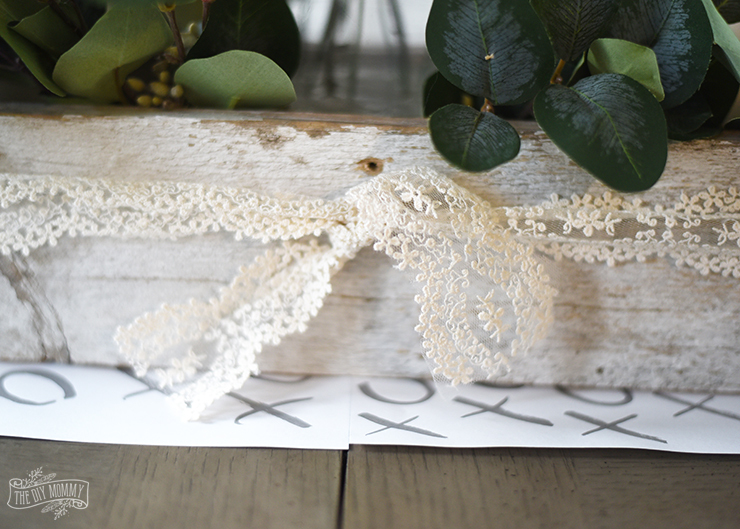 I bought the prettiest spool of lace last year with no plans for it, so I tied it around my centerpiece for a little added softness. 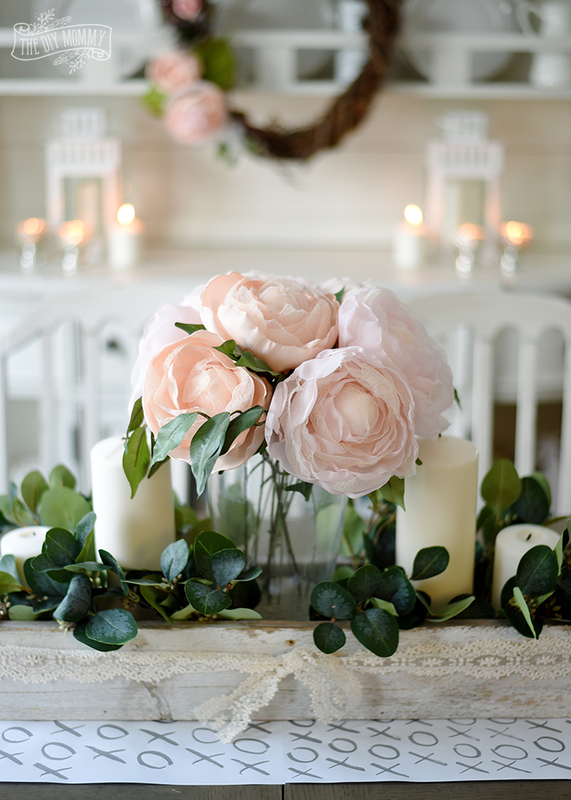 The final look is simple, elegant, and 100% romantic! 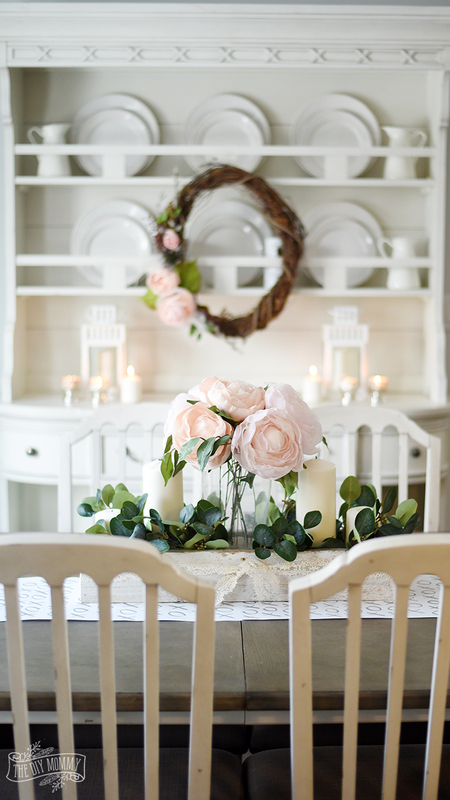 Between the curves of our table legs and the twinkle of these candles, I can’t get enough of this Valentine’s Day inspired dining nook. Here’s to romance and thrifty decorating! Oh, this is so lovely! I’m in love with the lace and soft pink. and the hint of spring the peonies bring to the table!